“Every film I’ve made is about overcoming obstacles,’’ says Mary Mazzio, who in the new documentary “Ten9Eight’’ focuses on teenagers who must struggle with poverty. You might think a Needham High School grad with an Olympic pedigree would not have much in common with a group of teenagers from the nation’s poorest cities. 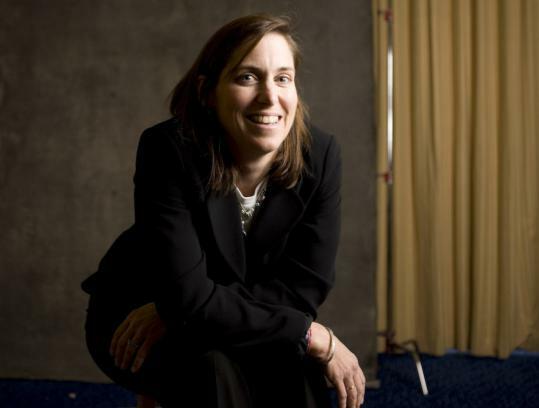 But filmmaker Mary Mazzio, who lives in Wellesley, says she has always understood the underdog, and her new film, “Ten9Eight,’’ proves it. The movie follows a dozen high schoolers vying for the top prize in the annual Network for Teaching Entrepreneurs competition by creating companies for such products as custom-made guitars and healthy pet snacks. Financed in part by the Kauffman and John Templeton foundations, the documentary was written and directed by Mazzio. It opens at AMC Loews Boston Common 19 on Nov. 13. Q. Is there anything in your own life, your own growing up, that connected you to these kids? A. Every film I’ve made is about overcoming obstacles. And I have no clue, as a white, middle-class 40-some-year-old hockey mom, the pain and the challenge and the struggles that these kids face with the everyday ravages of poverty. That being said, I put myself through college, put myself through law school. It’s funny, growing up after my parents divorced, we had a dinner of spaghetti and ketchup. My mom had gone on Food Stamps and I never knew it. Q. I also wonder whether your experience as an athlete [Mazzio rowed for the United States in the 1992 Olympics] helped you connect. Q. This film does mark a departure in some ways. Your other films include celebrity entrepreneurs and athletes. A. It is and it isn’t. My first movie [1999’s “A Hero for Daisy’’] worked with no celebrities. And I loved these kids because they’re like every other kid in America. What I learned through this process is we’ve got these great kids in the film - 12 of them - but there are hundreds or thousands of kids like them. Everywhere. And they just need a little bit of water. Q. Are you curious about what ends up happening to these kids? A. In the course of making this film, one of our kids discovered he had gotten his girlfriend pregnant. And all of these kids are on the bubble. None of them have money for college. Many of them, their parents are suffering from drug addiction. So not all these kids are going to make it. I love them all and I’m rooting for all of them and I have thought about whether we come back in a few years and see what happened to them. Q. Any regret about your brief, on-screen performance of “Rapper’s Delight’’ during the credits?